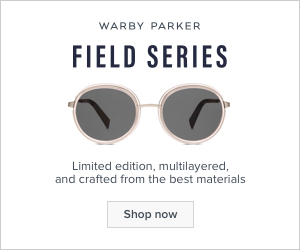 Warby Parker was founded with a rebellious spirit and a lofty objective: to offer designer eye wear at a revolutionary price, while leading the way for socially conscious businesses. We believe that buying glasses should be easy and fun. It should leave you happy and good-looking, with money in your pocket. We also believe that everyone has the right to see. Almost one billion people worldwide lack access to glasses, which means that 15% of the world’s population cannot effectively learn or work. To help address this problem, Warby Parker partners with non-profits like VisionSpring to ensure that for every pair of glasses sold, a pair is distributed to someone in need. Reed - Reed sports a layer of precisely sculpted acetate between two layers of titanium, with tonal lenses for a monochromatic look. Grady - Grady's rounded lenses are outlined in two distinct layers: first titanium, then acetate with eye-catching cutout details along the brow line.